This original musical marriage proposal gained 3.3 million views on YouTube in three days. This video is a creative collaboration between film-maker Callum Cooper, sound artist John Kassab and Klezinski, a multi-disciplinary design practice based in London and Melbourne. The clip itself is shot with a camera attached to a moving “jump-rope-like” device, thus covering a full circle equal to 360°. The actor, location and scene change with each passage of 360°. The video was created as a showcase of Klezinski’s hand-crafted fashion clothing and accessories. This fun video for Graham Coxon’s catchy song “What’ll It Take” is made up of dance video clips sent in by 85 fans from 22 countries. These dance video clips were mashed up with added after effects and graphics in a an animated model throughout the whole video. The video background is shot in the Aldgate area of East London, around Middlesex Street, Petticoat Lane Market and nearby Liverpool Street. A great, beautifully realized concept with a very well fit song. Max Zorn creates something out of barely nothing – brown packing tape and a scalpel. The technique is all about taping several layers of tape. Each layer is precisely changed with a scalpel thus creating an image of art. Max began this last year in Amsterdam and made several works of art in Portugal and Spain, Germany and other countries worldwide. 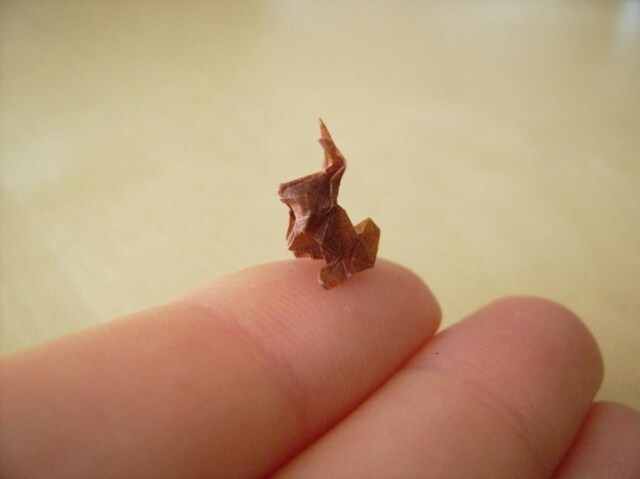 In the childhood we used to create paper figures using origami technique. It was very hard and time-consuming. Usually it was a disaster. You tried for so many times and the result wasn’t as expected. Now today we present a new level of origami art. Imagine the small origami figures not bigger that your cell phone, but now imagine a small coin or even smaller. Only few millimeters. Don’t think it’s possible? For example this rabbit only 18 millimeters. Tea candles are useful for many ideas because of their specific design. Doesn’t a tea candle remind you of a pixel? The author of this viral idea found out that and placed tea candles in a proper order. Then with a photo camera a stop motion animation was created. You can see motives of many popular games or pictures on that “Tea Candle Screen”. It is interesting – how many hours did it take to create this stop motion fire animation. Just remember – don’t try this at home for your own safety. A flashy advert on the wall of a building isn’t anything new but a 3D projection is. New thinking in advertisement means new possibilities. “New thinking, New possibilities.” – the new slogan for Hyundai Accent. A great example of internet viral marketing. Art work by Shinichi Maruyama and Tetsushi Wakasugi. A slow motion movie about the shapes of water. Its unbelievable how much our eyes can’t see. Only thanks to modern technology we see the beauty of a moment.